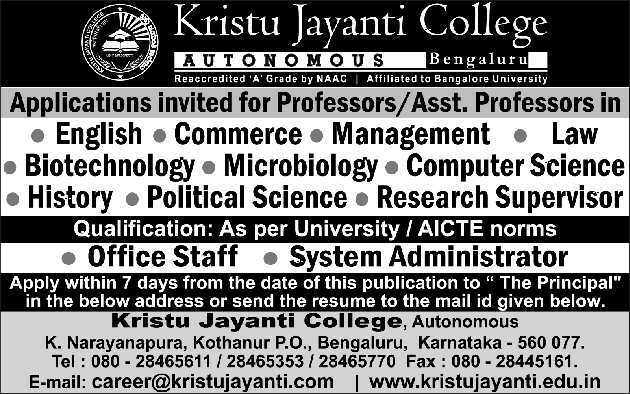 Kristu Jayanti College Bangalore has advertised in THE HINDU Opportunities newspaper for the recruitment of Professor / Assistant Professor Plus Non-Faculty jobs vacancies. Interested and eligible job aspirants are requested to apply within 07 days from 18th October 2017. Check out further more details below. College Profile: Kristu Jayanti College, founded in 1999, is run by "BODHI NIKETAN TRUST", formed by the members of St. Joseph Province of the Carmelites of Mary Immaculate (CMI). The college is affiliated to Bangalore University and is accredited with highest grade 'A' by NAAC. The college is recognized by UGC under the category 2(f). The college was accorded autonomous status from 2013 by the University Grants Commission, Government of Karnataka & the Bangalore University. How to Apply: Interested and eligible candidates are requested to send application along with CV, attested copies of certificates and recent PP size photographs to the following postal address or email address.